The production of proteins is fundamentally important for the normal function of cells. This process needs a lot of energy. Therefore, protein production is well coordinated with the needs of the cells to conserve energy. However, under certain conditions, excess protein production may take a substantial fitness cost that is commonly referred to as protein burden. With the objective to improve engineered protein production systems, it is desirable to evaluate how sensitive different species are to protein burden and identify the impact of environmental and genetic factors that could shape the cellular response to protein burden. Their study revealed that accumulation of an unneeded protein in yeast has a relatively mild impact on fitness under stress-free conditions. The fitness costs associated with expressing unneeded proteins was not found to be the result of protein toxicity or impaired metabolic processes. However, the extent of protein burden was substantially different across genetic backgrounds and environmental stresses. 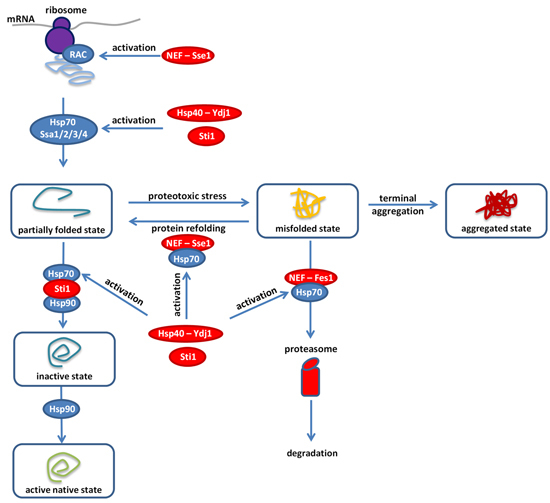 The study highlights that protein burden can be increased via the impairment of several cellular systems, as genetic and conditional inactivation of members involved in different steps of the protein production pathway – such as transcription, translation, amino acid metabolism, and protein folding – rendered yeast cells hypersensitive to protein overexpression. Most importantly, as part of the results, the author tested both the impact of high temperature stress on protein burden and the chemical induction of protein misfolding and concluded a crucial role of the Hsp70- associated molecular chaperone network in mitigating protein burden. Moreover, a specific assay also revealed that cellular proteins were more prone to aggregate and became non-functional under protein burden in mutant cells with impaired chaperone network than in the wild-type strain. To provide a mechanistic explanation for protein burden, the authors also performed physical interaction screens. As a result, they found that protein burden could disturb the interactions among the members of the Hsp70-90 chaperone network, specifically by weakening the interactions of a scaffold protein (Sti1p, an important regulator of the chaperone network) and thereby disturbing the activity of the network. The authors have raised an important implication for future studies in the biotechnology and protein engineering fields. They proposed the possibility that highly expressed proteins may perturb key components of the chaperone network which otherwise would be used to navigate folding of native proteins within the cell. As protein burden can be magnified via high temperature stress, enhanced protein mistranslation and misfolding, they concluded that normal activity of specific molecular chaperones enables tolerance to massive changes in genomic expression by reducing the damaging impact of gratuitous protein overproduction. Collectively, their study provides several lines of evidence that support the substantial importance of molecular chaperones in the mitigation of protein production costs. Csaba Pál is a highly accomplished researcher with important contributions to several related fields, including antibiotic resistance research, genome evolution, systems biology and microbial experimental evolution. Csaba had the opportunity to conduct research in Oxford, Heidelberg and Italy prior returning back to his home country, Hungary, where he started his own group in 2008 at the Biological Research Centre (BRC), Szeged. He was awarded both the ERC Starting Grant (2008 – 2013) and ERC Consolidator Grant (2015-2020). He has more than 50 scientific publications, the majority of which in leading journals, such as Nature and Science. He has been awarded the Ignaz Lieben Prize by the Austrian Academy of Sciences in 2009, the Szent-Györgyi Talentum Prize in 2014, and the prestigious Bolyai Award for his research conducted in antibiotic resistance in 2015. In 2016, Csaba became a member of the Academia Europaea, and one year later in 2017 he has been elected as a member of the European Molecular Biology Organization (EMBO) as well. Csaba is also member of several editorial boards (Molecular Biology and Evolution since 2014, Biology Direct since 2015, and Plos Biology since 2017). Zoltán Farkas received his PhD degree from the University of Szeged in 2011. During his postdoctoral years, Zoltán joined the Biological Research Centre (BRC) of the Hungarian Academy of Sciences in Szeged, Hungary. Zoltán’s main interest is the investigation of evolutionary processes and cellular networks of yeast. He is mainly focusing on the basic principles of compensatory adaptation as a major driving force in evolution. Zoltán has participated in several international conferences and has several publications in top-rank journals, such as Nucleic Acid Research, Plos Biology and eLife. Zoltán has received a two-year Hungarian Academy of Sciences Postdoctoral Fellowship in 2015, and a four-year grant by National Research Development and Innovation Office in 2018. Zoltán is also the member of the Hungarian Society of Microbiology and the Hungarian Society of Genetics. Farkas Z, Kalapis D, Bódi Z, Szamecz B, Daraba A, Almási K, Kovács K, Boross G, Pál F, Horváth P, Balassa T, Molnár C, Pettkó-Szandtner A, Klement É, Rutkai E, Szvetnik A, Papp B, Pál C. Hsp70-associated chaperones have a critical role in buffering protein production costs. Elife. 2018 Jan 29;7. pii: e29845. doi: 10.7554/eLife.29845.